I had this idea that the way we eat is killing us. I don't think I made this up. It seems like there are warnings all over the place about foods. Shows like The Biggest Loser and Jamie Oliver's Food Revolution really hit home the fact that obesity and diabetes are on the rise like never before. High red meat intake was also associated with increased risk of esophageal and liver and a borderline increased risk for laryngeal cancer. And high processed meat consumption also was associated with borderline increased risk for bladder cancer and myeloma, a kind of bone cancer...In addition, both red meat and processed meat consumption were associated with increased pancreatic cancer risk in men, but not women. 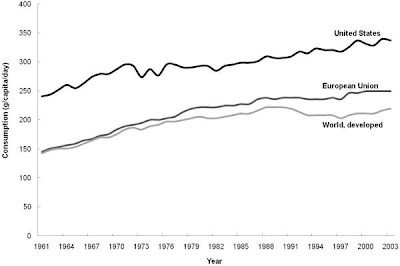 Americans are eating a lot more meat than we used to. If the research on disease is right, than we are all increasing our chances of cancers, etc. Now, I'm not advocating not eating meat. Anyone who knows me knows that I like a good barbecue as much as the next guy. But what I am trying to get to is the idea of a balanced meal. I had developed this theory that the subsidy system and food industry was producing more of the foods that are bad for us, driving price down on those items, and making us sicker at the same time all in the name of profits. It sounds crazy, but I had some time to kill so I thought I'd look into it. First, let's understand what a balanced meal is. In 2011 the government got rid of the pyramid and now have a much better way of showing you what you should be eating. This is an outstanding info graphic. If you go to the website, this graphic is interactive. Clicking on the different sections will take you to drill-down information on vegetables, fruits, grains, etc. I was surprised at how much protein they recommend eating. By protein they mostly mean meats, but also include fish, nuts, and beans. This is the original food pyramid which was designed in 1992. It replaced a much simpler graphic that showed all food types as equal--four squares. Interestingly, it was very controversial when it first came out because the food industry did not want the government telling people they should eat less meat than vegetables. Nutritionists also had a problem with it because of the emphasis on grains (huh?). Just for giggles, I also included the revamped federal food pyramid for reference. Released in 2005, this is an information visualization disaster. Oldways is my personal favorite. Old Ways is an organization that promotes traditional diets from cultures historically known to be more healthy than everyone else. They are doing some really interesting work in the areas of diet research and promotion. The pyramid was created using the most current nutrition research to represent a healthy, traditional Mediterranean diet. 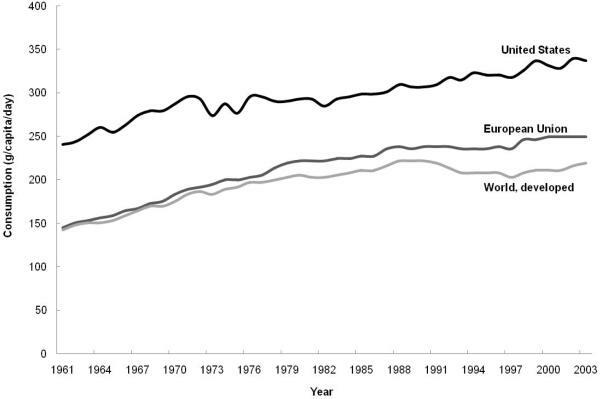 It was based on the dietary traditions of Crete, Greece and southern Italy circa 1960 at a time when the rates of chronic disease among populations there were among the lowest in the world, and adult life expectancy was among the highest even though medical services were limited." Comparing them, the Oldways pyramid is much more clear about getting more of your protein from fish, dairy, and vegetable sources. Red meats are the most limited kind of protein. The USDA plate, although the easiest of all to use, is much more ambivalent about where your proteins come from. This would allow a diet high in red and processed meats to fit the model, even though these are some of the most likely suspects for various kinds of cancers. Also, the Oldways pyramid includes a glass of red wine with dinner. Allllriiiighhhttt! Comparing Prices--Are there different ideas at work? The costs of buying local food has also been on my mind. Is local food really more expensive? So many people are in favor of higher prices for local food because they claim it is more accurate price of what the food actually costs, plus it keeps more dollars in the local economy. I think these are great points, but if local food is ever going to be anything more than a dinner party braggable for the bourgeois, then the pricing really needs to be able to compete with mainstream foods. Josh from Stone-Buhr understands this. Few others do. My conspiracy theory goes along these lines: Americans eat more meat because meat is cheap and this is bad for us. Why would this be? I don't know. I've read that, sociologically, meat played a symbolic role in American culture, especially after WW2. It represented success. It also represented affluence and something to aspire to after the hard times of global warfare. The decadent, juicy steak at a swanky restaurant. The good times of hamburgers on the grill with friends in the summer time. The elegance of marinated, thinly sliced flank steak layered over a bed of baby greens with blue cheese crumbles. Etc. In order to make the most money, the meat industry played these ideas up while also bringing prices down. Everyone could partake of the good life. The combined effect of this bought a flood of money to the meat industry. The birth of the fast food industry in the mid 20th century exacerbated this trend. Maybe the health implications were unknown at the time, but the profit motive certain was not. I went to two grocery stores and the farmer's market to see how things priced out. I was looking to see how meat prices compared to other products. My thinking was that pricing structures that support a healthy diet would make meat more expensive than vegetables, grains, etc. My suspicion was that the pricing structures did not support a healthy diet by making meats artificially cheaper than they should be thereby encouraging people to skew the balance of their diet toward meat. My unscientific methodology was pretty simple. If you bought 10 items and spent $10 on each, how much could you get? I went to New Seasons (premium grocery store), Fred Meyer (normal grocery store), and the St. Johns Farmers Market. I compared items as close as I could but admittedly did not get apples to apples (the farmer's market had a different selection than the grocery stores, especially in fruit). Just looking for low, everyday prices on standard items. My own notion was that corporate pricing in the grocery stores would lend itself to a less healthy diet, and the farmer's market pricing would be more true to a healthy diet. As it turns out, I was totally wrong. You could get more vegetables, less meat, and a middle portion of eggs and beans from all of the vendors. The pricing scheme at each place was roughly in line with the food pyramids above. Despite New Season's healthy image, their price structure was almost exactly the same as Fred Meyer, just a little bit more expensive overall. And the farmer's market was not much better, just a lot more expensive overall. Relative volumes of food purchased with $10 each based on averaged pricing. The only thing that can be said, is you'd probably be less likely to over-eat if you shop at the farmer's market because you simply get less for your money (perhaps helping with overnourishment and it's associated health problems). Fish is too expensive. Old Ways encourages more fish eating than red meat, but at these prices beef is the more affordable option. Beef should be much more expensive to discourage purchasing. Beef was most expensive at the Farmer's Market (but so was everything else). Fruit is over priced. This changes with the season and is an average, but it should probably be closer to the price of vegetables (apples actually were, but anti-oxidant rich berries were super expensive). Eggs could be a little more expensive, just to get them more in the proper place. Because my initial price gathering was pretty limited, I will probably continue to test pricing. In the process of collecting this information I realized just how much variability there could be and how much more research would be needed to give a truly accurate picture. But it's interesting anyway. What it did do is get me thinking in other directions. If the problem isn't the pricing structures themselves, then maybe it is something else. Maybe is it just the way we choose to spend money. If our purchasing habits reflect the way we think about food, then the problem may be just the way we think. Imagine you are going to cook dinner. If you are like me, you think of the main item first, then build out the things that go around it. For instance, for dinner tonight, I could cook pork chops, then put a simple garlic pan sauce over it. Some boiled baby potatoes would go nice with that. For greens, I can use either the asparagus I bought at the market or go trim some lettuce from the garden for a salad. This is how I think through cooking dinner for the family. What is wrong with that way of thinking? Most of the food groups are represented. It's home cooked with local, (mostly) organic ingredients. It's not overloaded with fats, processed oils, or sugars. It leads to the whole family sitting down together and eating together. Everything that a meal is supposed to be is here. But what it also is is centered on a single chunk of meat that becomes garnished with all the things that are good for you. Potatoes are chosen because they match the flavor of the pork chop. The greens are chosen because they don't conflict with the flavor of the pork chop. Had I started with a salad as the first thought, then I probably would not have ended up adding a pork chop. At most, some slices of very lean pork tenderloin might have shown up. It's this way of imagining what we eat that drives us to have unhealthy diets. To avoid the pitfalls of excessive meat consumption, create balanced meals that are more in line with the recommendations, and truly treat food as a primary means to good health, we need to upend the way we envision the plates of food we prepare and how we see ourselves eating them. I was hoping to see a more informed perspective from the professionals in this world. If anyone should understand the nature of meal and menu preparation, I thought it would be them. But unfortunately, this is not what I found. At least not in the way they talk about their food and describe it on the menus. As an example of affordable, mass-market dining, Denny's really focuses on the meat in the meal. Their descriptions and pictures are all very clear about what the priority is. If red meats and proteins were supposed to be 90% of the meal, Dennys would be right on. Denny's Steak and Shrimp dinner. The name says it all. This is almost the exact opposite of what the food guides recommend. The LePigeon dinner menu for June 20th. Meat, meat, meat, meat, mushrooms, meat. LePigeon is an upscale french restaurant here in Portland. I was hoping that price would influence perspective but that didn't happen. Again, the meats are the focus at dinner time. Granted, LePigeon is devoted to excellent food. My understanding is that they source as much of their ingredients as locally as possible. They make no mention of this on their website, however, because their focus is quality and deliciousness. To people not familiar with preparations inspired by rustic french cooking, some of the dishes may seem "out there". But they are delicious. Unfortunately, they are also totally unbalanced. The menu continues to use language that favors proteins over everything else. Paley's Place is one of my favorite restaurants in Portland. Vitaly Paley is regularly recognized as one of the top chefs in Portland and his restaurant gets all kinds of awards. The Paley's Place cook book is also very good. Paley also has a focus on local, organic, sustainable ingredients, which I really appreciate. But when we look at how the dishes are characterized, it is the same problems. Paley thinks meat first. In the entree list, 4 out of 5 of the dinner entrees focus on the meat and only secondarily mention the accompanying vegetables. There is a seafood section that comes after this where everything is meat based. We are supposed to be eating more fish than red meat, but it is still the psychology of "proteins first." I would like to point out an interesting disconnect. Take for instance this beautiful image of what looks like seer'd tuna and a spring salad that I stole from the Paley website. Not doubt this dish was described as a tuna entree that also happened to come with some greens. But if you look at the actual portions, the tuna is not so dominant as the name implies. The photographer, like the menu writer, is focusing on the tuna, but the chef that composed the meal actually gave a lot of balance to the accompanying vegetables. 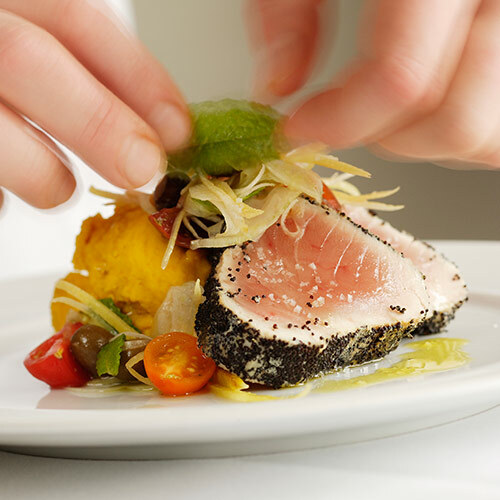 In fact, the greens provide a physical foundation for the main attraction--the tuna. I have to say, that through the course of my investigations, I really didn't find anything that provided a nice contrast to the repetitions I was finding. This was a bummer because I was hoping to have an example to contrast with. But, whether cheap eats or fine dining, the language of food is very similar everywhere. If language is thought, then there is a lot of similarity in the way corporate menu planners and executive chefs think about food. Most of that thinking gets focused on the "main" item of a dish which is normally the big protein. This way of thinking about food is in sharp contrast to the way we are supposed to be actually eating based on the food pyramids. How did we start thinking this way? I don't believe the meat industry created this phenomena. They just capitalized on it. Here is my theory on how this came to be: In the past the wealthy and the common folk ate differently. The common folk could not afford as much meat and ate only one course meals mainly. The wealthy could get whatever they wanted to eat (mostly) and took more time at home to have leisurely multi-course meals with all their smelly friends. What else would you do without movies and internet and cars and video games? 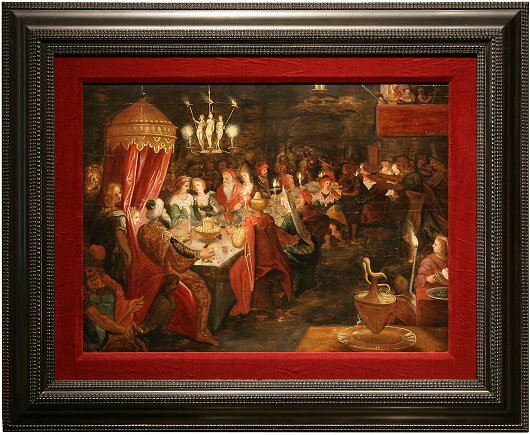 Circle of Frans Francken the Younger, (1581-1642) Belshazzar's Feast. The main meal was vegetable pottage. Again, if the family was lucky there might be some meat or fish to go round. Bread would be available and ale. The poor ate closer to the food pyramid (less meat and more vegetables and grains) in one course. The wealthy at closer to the food pyramid but spread it out across many courses. Our current diet has roots in classical, aristocratic dining. The hotels adopted it, Escoffier codified it, and we live it. And, thanks to government and industry, it is made up of foods that only the wealthy could afford in years past. But, in our modern, democratic disdain for the hoity-toity aristocracy of the past, we eat like peasants--usually only eat a single entree plus maybe a desert or appetizer. Because of that, we are jumping straight to the main course (the big protein), bypassing the other courses that provide for an overall balanced meal. The occasional exception is that even though the language may not be that much different, sometimes in fine dining the actual meal may not be as unbalanced as in lower cost establishments. Compare the Paley's tuna meal to the Denny's Steak and Shrimp. Denny's is clearly the meal with a higher percentage of red meat and heavy fats. And it is cheaper. And obesity is linked to social class. No kidding. How do we fix this? I think a good place to start is quiche. What is in quiche? Almost anything you want. Is quiche a meat or a vegetable? Probably both. Does it give primacy to a big protein? Well, besides the fact that it's mostly eggs, no. We've often had frittata at home filled with only vegetables. And they were wonderful. Gratins would fit the bill also. So would salads. So would soup. So would stir-fry. So would gumbo. So would a calzone. There are a lot of meals we could make that are not formed around language the reinforces an unbalanced view of what a meal should be. When eating a simple dinner after work, maybe it's best to conceive of meals that are "one pot" style meals. Soup with crusty bread could be perfectly balanced, and it gets us out of mentality that you build a dinner by starting with a slab of meat then adding some veggies. A summer salad of fresh greens, baby sweet onions, lentils, cucumber, goat cheese crumbles, a few flank steak slices, and a light vinaigrette would perfectly balanced. A calzone filled with spinach, garlic, some bacon crumbles and gruyere with a side of pear slices would be delicious. Quiche could be a perfect surprise. Lots of veggies. A little chicken. Some cheese sprinkled on top. You just ate the food pyramid properly and your chance of getting cancer is theoretically lower. When several courses are involved, it makes more sense to have a big steak and shrimp plate in there somewhere. But the rest of the food pyramid shows up also. It's just exploded out across several plates. By changing the way we talk about food, and consequently the way we conceive of our meals, maybe we can start having intrinsically better meals for the health of us all. In the interest of practicing these ideas, I've been trying to bend my thinking to this new model. It is hard. Like the example I gave before, my normal way of imagining meals is to start with a main ingredient and build out. In this new model, it is easier to start with the pot you cook with and add in. I've found that the way I describe even one-pot meals tends toward old habits. I'm making a simple seafood stew. By volume, the dominant ingredient is tomatoes and clam broth. However, I call it seafood stew. Why don't I call it tomato and clam broth stew? I don't know, but proteins are powerful things and it's going to take some practice to break out of their hold.